Williamsburg - Fresh off a victory over ACC foe Wake Forest, the William and Mary men’s basketball team garnered some national attention from ESPN and Fox Sports on Monday. ESPN.com’s Andy Katz listed the Green and Gold among the programs under consideration for Team of the Week in his Weekly Watch, while FoxSports.com's Jeff Goodman had an entry in his daily blog about the Tribe's recent success. Click HERE to read Goodman's blog. Click HERE to visit Katz’s Weekly Watch. After opening the week with a victory over Hampton, the Green and Gold shocked Wake Forest, 78-68, in the Lawrence Joel Coliseum on Saturday night. W&M led for virtually the entire game in becoming the first Demon Deacon opponent ever to win in Joel Coliseum during the month of November. The victory also marked the College's first over an ACC opponent since 1984 and the first at an ACC foe since 1977. Our Old Living Room featured on HGTV!!! Jon's sister told me today that a shot of our old living room from our house in SC came on the screen today while she was watching HGTV today. 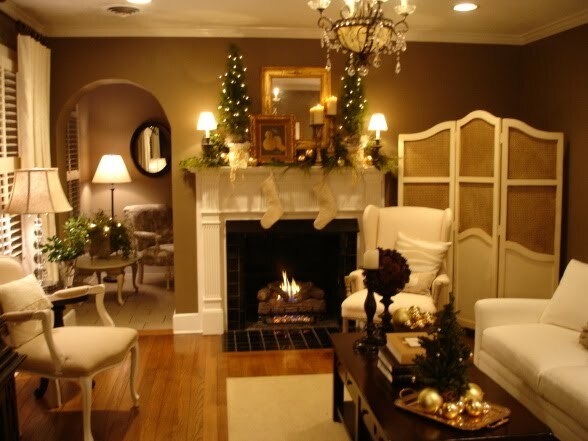 I just went to HGTV.com a few minutes ago to see if I could find anything out about it (I didn't submit anything so I was really surprised, but I did put pictures up of our old house on Rate My Space a year and a half ago) and sure enough it was featured in their "Favorite Holiday Ideas" as the second room! So exciting! Update: I started paying attention while watching HGTV and sure enough I have seen our room a bunch of times now - it's so exciting!!!! HUGE UPSET!!!! We beat Wake Forest!!!! Wow! In quite the shocking upset William and Mary beat Wake Forest AT Wake tonight by 10 points!!!!!! This snapped a 23-game home non-conference winning streak for Wake Forest. W&M joined Utah as the only non-BCS teams to win in Joel Coliseum, but in comparison the Utes were ranked 11th in the country at the time. We are so very excited! Who would have thought??? We are so proud of the Tribe! YAY!!!!!! That's four wins in a row now for us!!!!!!! Sneak Peek of Lillabel's First Birthday Party! Here is a sneak peek of Lillabel's first birthday party. We are having it in two parts. We were hoping to have it while everyone was here but due to games, and everyones schedules we had part of it last night once Jon got home and will have the rest on Sunday evening. Last night we had her cake and opened a couple of gifts. We will have her cupcakes and open the rest on Sunday. Seeing how Lillian seems to be turning into quite the tomboy I am thinking this will be the one and ONLY pink party I will ever get to throw for her! Haha! Hello everyone! We all hope that you all had a wonderful Thanksgiving! Everyone arrived late Tuesday evening and we had a fun-filled day on Wednesday which ended with a big William and Mary basketball game. We beat Hampton by one point! That's three wins in a row! YAY!!!! Then we had a wonderful Thanksgiving yesterday! We had a delicious meal and then went on a walk in Colonial Williamsburg and ended the day with the beginning of Lillian Annabel's birthday celebration. (More about that later). It is so nice having everyone down here. I don't think I have seen my family on Thanksgiving in about five years! And we still have two more days with everyone here! Yay! Late Night for Miss Lillabel! Yay - We had so much fun last night at William and Mary's home opening win against Richmond!http://tribeathletics.com/story.php/9573/ Lillabel actually sat through the whole game and enjoyed some funnel cake during the second half. Afterwards, she had a ball running around on the court! She adores Kendrix's Brown's little sister, Kyla, and kept running after her and wrapping her chubby little arms around dainty little Kyla's waist! It was soooo cute! It was the first time she's ever really gone up and hugged someone! It was a great game and so much fun to watch! Their next game is at Manhattan tomorrow. Go Tribe! Gotta Love the Antique Mall! This Saturday Dana and I were at the antique mall hunting for a mantel for her place (which we did find!) and lo and behold this adorable vintage style toy car was sitting on one of the booths! We practically squealed with delight. I have been wanting to get Lillabel one since the day I found out we were having a girl. They have similar one at Posh Tots but it was soooo expensive. So, needless to say we snatched this right up and are going to give it to her for Christmas! Unfortunately it weighs a ton so it is sitting in our living room until Jon lugs it to the garage so she has been playing with it for the last few days! I am so excited about it and can't wait to use it for some Dear Lillie photo shoots this spring! So about a year ago I was contacted about having two of my rooms featured on Design Dazzle - Lillian Annabel's nursery and our guest bedroom. I gave them the info and sent my very amature photos and forgot all about it. This morning I received an e-mail saying I was one of ten finalists in their baby nursery contest! I won't win, seeing how the basis for winning is how many comments you get and I do not know anyone who blogs, but oh well, it was exciting to be picked! It also made me think to post some pictures of our homes on our blog so people can get a broader feel for who we are as designers beyond just clothing and accessories. For now, I will just post pictures of my place but in time Dana, Jamie and my mom will add their photos - although seeing how they are each in somewhat of a moving process it may be a while! 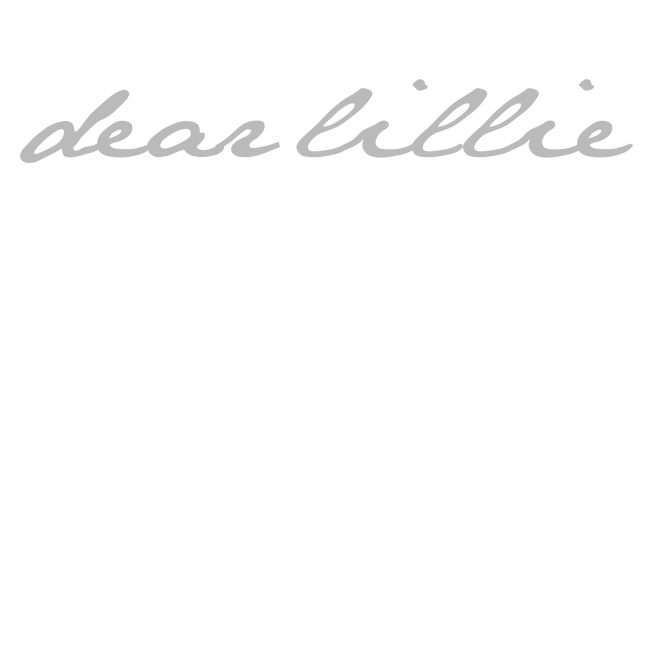 Interior architecture and design is probably my first love as an artist, and I hope to someday include a home line at Dear Lillie. Yay! Our blog is up and running! 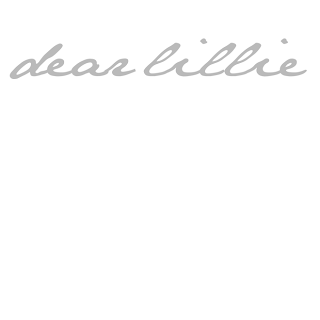 Okay - so Dear Lillie now has a blog. I still want to play around with the layout and design of it, but at least we have it up and running! As I have time I will work on making changes!